The ultimate union of form versus function: the floor mount system of building this closet makes it resemble a piece of fine furniture, but it doesn't skimp on any functional storage requirements. This versatile closet design is appropriate in either a larger, high-end reach-in closet, or against one wall of a walk-in closet. 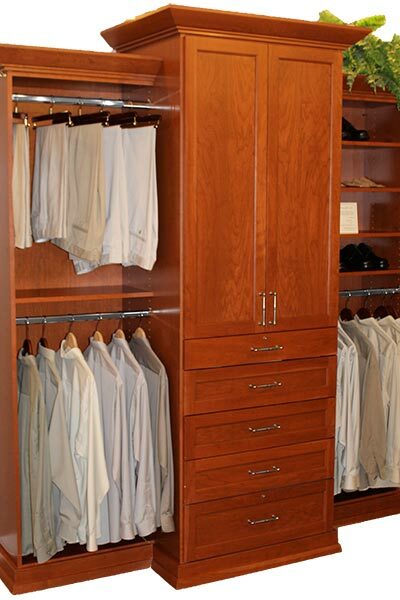 Some clients may even want to display a closet system this beautiful out in the open. A central wardrobe style unit is flanked on either side with hanging and shelving space. The doors and drawers add a level of elegance many homeowners may not want to cover up. Crown moulding adds a finishing touch to the top shelf.